If you could get a tablet for the price of a smart phone, and if it also worked on one of the new, faster, 4G-class cellular networks, you’d jump at the chance, right? Dell and T-Mobile hope so, and that’s why they’ve brought out the Dell Streak 7, at just $200 with a two-year service contract. The Streak 7, Dell’s second effort to compete with Apple’s $500 iPad, is the least expensive tablet I’ve seen from a major manufacturer, and claims to be the first capable of 4G cellular speeds (it also has Wi-Fi). Like many planned iPad competitors, it runs Google’s Android operating system. It’s also the first I’ve tested using a fast new processor from nVidia, the Tegra 2, which will power a number of new tablets this year. Unfortunately, after a week of testing, I found the compromises Dell made to get to that low price make it impossible for me to recommend the Streak 7. Its screen, battery life, and software are all disappointing, and vastly inferior not only to the iPad’s, but also to those on the Samsung Galaxy Tab, a high-quality Android tablet about the size of the Streak 7 released late last year. In other words, you get what you pay for. 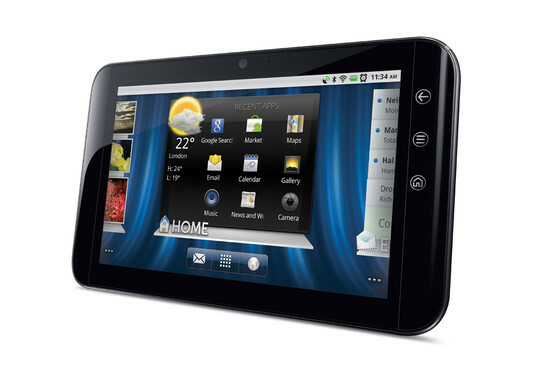 Like the Galaxy Tab, the Streak 7 has a 7-inch screen, measured diagonally, or less than half the size of the iPad’s. But it’s large enough to be properly called a tablet, unlike Dell’s first Streak, an odd tweener device with a 5-inch screen—more like a big phone—that was released last year to a tepid response. Dell concedes it wasn’t trying to build “the Cadillac of tablets” with the Streak 7, but was aiming for budget-conscious families and home use. Dell notes it has plans for a range of tablets with different prices, screen sizes and specs. The Streak 7’s screen, battery life, and software are all disappointing. In other words, you get what you pay for. The Streak 7 has some strengths. Like the Tab, it’s smaller and lighter than the iPad, so easier to hold in one hand. It plays Flash videos, which the iPad can’t. And it has front and rear cameras, unlike the iPad. It can also be used, unlike the iPad, as a Wi-Fi hot spot. Also, I found its cellular data speeds impressive. In tests I conducted in Silicon Valley, the Streak averaged 4.63 megabits per second in download speed on T-Mobile’s souped-up 3G network (which it calls 4G because it claims similar speeds). That was nearly twice as fast as the download speeds provided by my hotel’s Wi-Fi network. Cellular upload speeds were a bit slower than Wi-Fi, but still averaged about 1.2 mps. But, in my view, the Streak 7’s minuses outweighed its pluses. Let’s start with battery life. In my tests, the Streak 7 conked out after a pathetic two hours and 10 minutes of watching movies. That compares with about 11.5 hours of continuous video playback for the iPad and just under seven hours for the Galaxy Tab, when I tested them. In a more mixed-use pattern, including Web surfing, game playing, music, email and social networking, with some short videos thrown in, the Streak 7 lasted between 5.5 and 6.5 hours, still underwhelming for a tablet. Dell says its target audience will use the Streak 7 plugged into wall outlets and TVs through an extra-cost dock, but I wouldn’t buy a tablet with battery life this poor. Screen resolution also was so low as to be fuzzy at times, especially in reading small type, and viewing the screen at an angle often reduced the image to a ghostly outline. The Streak 7’s screen has a resolution of 800×480, below the much smaller iPhone screen, and well below the resolution of the iPad or the Galaxy Tab. While the internal chips drove video fine—as long as the batteries lasted—it looked worse than on the other two, as did photos. The software also is a problem. It’s an older version of Android, called 2.2, which was never intended for tablets, and whose core apps—such as email, contacts and calendar—were designed for the smaller phone screens. Months ago, Samsung used the same version of Android on the Tab, but compensated by rewriting key apps to take advantage of the tablet screen, with more PC-like designs. Dell has done none of this on the Streak 7. All it added was a thin user interface called Stage featuring big, blocky widgets that group things like contacts and social updates, an old concept. It preloaded some kid-friendly and family-friendly apps, but some are mere come-ons that require downloading the full app. Worse, the Streak 7 appears shortly before the true tablet-optimized version of Android, called Honeycomb, and Dell can’t promise that Streak 7 buyers can upgrade to Honeycomb. The company says the device has been designed to accommodate an upgrade, and is hopeful that it’s possible. But there is no guarantee. Buyers might get stuck with the old version built for phones. Even on a tight budget, the Streak 7’s deficiencies might not make it worth the price. You’ll pay T-Mobile $30 or $50 a month for a capped data plan for two years. By contrast, the base iPad requires no payments to a cellular carrier, as it’s Wi-Fi only. Even if you buy the iPad with cellular connectivity from AT&T, there is no contract. You pay $15 or $25 a month and end the cell service at will, with no penalty. You can buy the Streak 7 without a contract, but then it costs $450, too much for a device with its drawbacks, and only $50 less than the far superior base iPad. Even the Streak 7’s subsidized price of $200 is only $50 less than what its carrier, T-Mobile, charges for the better Galaxy Tab with a two-year contract. Dell is serious about competing in the tablet wars, and it may produce a winner yet. But its first efforts, in my view, missed the mark. Find all Walt Mossberg’s columns and videos at the All Things Digital website, walt.allthingsd.com. Email him at mossberg@wsj.com.